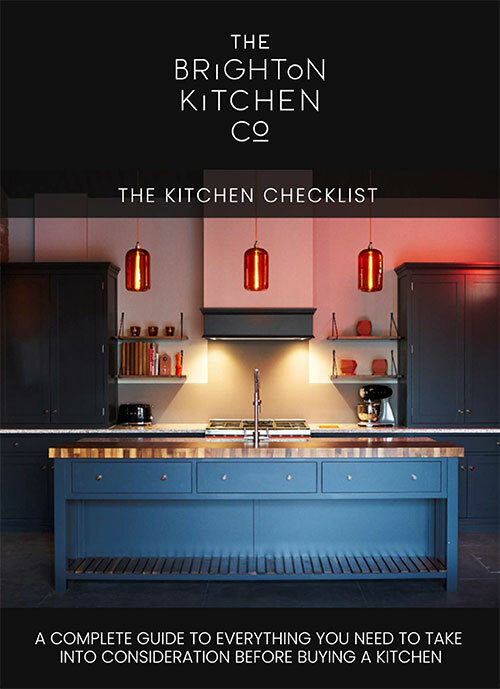 Here at the Brighton Kitchen Company, we take a huge amount of pride in the quality of our work and always go the extra mile to ensure that you receive the highest levels of service from the initial consultation and planning stages, right through to applying the finishing touches. It’s our attention to detail and innovative approach that has enabled us to provide clients throughout Brighton & Hove, Mid Sussex, East & West Sussex, Kent and Surrey with stunning kitchen designs. To help demonstrate the level of detail we offer as standard, here’s a complete guide to our 6 step kitchen design journey. Whether your kitchen is on its last legs or you just want to inject some life into the room using the latest trends, the initial stage is about formulating an idea. We encourage our customers to browse through our range of kitchens either online or at our showroom in Hickstead, West Sussex, to establish their design preferences. This will then give our kitchen designers a brief to develop these initial ideas into a full design concept. Once you feel inspired, we’ll book you in for a free design consultation in the comfort of your home. One of our expert designers will listen to your needs and help you start piecing together the style, layout and a wish-list of features. At the end of the meeting, you’ll be given a hand-drawn, first draft sketch of your dream kitchen, giving you an idea of scale and the layout. During the next stage in the kitchen design process, our designer will use the latest computer-aided design software to build the plans, elevations and visuals of your project. You’ll then be asked to attend a meeting with the designer, where they will talk you through the stunning 3D kitchen design on a big screen TV. At this point, you’ll get a chance to make any adjustments to the design and agree on a realistic project timeline to fit around your needs. Once you’re happy with everything, you’ll sign the contract and make the first deposit. The final stage in the design process is to attend a follow-up meeting where you’ll get to pick the finer details. From worktops and appliances to accessories and finishes, we have an incredible range of products to suit your preferences and elevate your design. Afterwards, you’ll be asked to place a second deposit to cover the expenses of these additional features. Sticking strictly to the project timescale, our team will fit every component and appliance to the highest of standards, leaving you with a beautiful new kitchen at the end. They can also undertake associated building works including plumbing, electrical, plastering & decorating. One of our unique selling points is what we do after the completion of your new kitchen. We don’t just load up the van and drive off into the sunset, we provide ongoing assistance to all of our customers. Not only will you receive a call from our designer after three months to make sure that you’re happy with your kitchen, but our team will be available for any queries whenever you want. And, if that wasn’t enough, we provide our customers with 10 year guarantees on all kitchen furniture and 2 years on installation, offering you complete peace of mind. If you like what you hear, then book a free consultation with us today. Our showroom is conveniently located just off the A23 near Hickstead Showground and only 8 minutes north of Brighton. For full address details, visit our contact us page.